It is with deepest sorrow and sympathy that the New York Skyliners, Inc. organization announces the passing of New York Skyliners Lifetime Member and Board Member Raymond Peters. Ray was involved with The Skyliners from 1983 through the present in many capacities. He was a long-time member of The New York Skyliners Alumni Chorus and The New York Skyliners Alumni Corps. 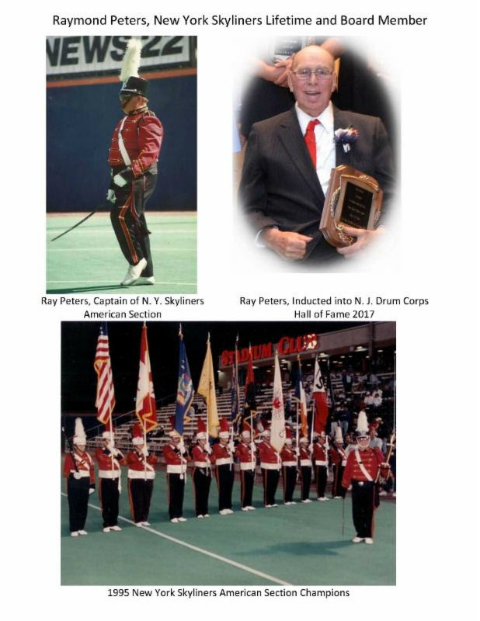 Ray was inducted into the World Drum Corps Hall of Fame as an Associate Member in 2001, and into the New Jersey Drum Corps Hall of Fame in 2017. At The Skyliners Ray played the Contra Bass, was a Member of the Honor Guard Section, and since 1988, he was Captain of The Skyliners Honor Guard Section, bringing home the World Championship Honor Guard Section Trophy multiple times, including in 1995 for the corps’ 50th Anniversary season, and as Undefeated Honor Guard Section in 2000! He last stepped on the field with the American Section for the corps in 2015. Ray always wore his uniform with pride, and as the Color Guard Captain, would lead The Skyliners onto the field of competition with a swagger, confidence and competitive spirit. He can be remembered leading the 1994 Drum Corps All Starts American Section (in traditional New York Skyliner uniforms) at the Thanksgiving parade as the massed corps played in front of Macy*s. No one could have led them better! Ray was also Quarter Master, “Head” Cook (where he made the famous – and tasty – “Ray-burgers” at “Chez Ray”), and Truck Rescue and Repair (he rebuilt more things on our older trucks (with the help of fellow Skyliners) than we can remember). Ray was also very involved with the Skyliner Booster Table – with his late wife, Patsy (along with Lorraine Marshello and Carol Holton) – and in more recent years with Barbara Lippincott. You name it, Ray has probably done it! Ray’s participation with drum corps included Barringer Walker from Lyndhurst, NJ – 1954 / 1955; Doremus from Hackensack, NJ – 1950’s; Chessmen from Newburgh, NY; Rough Riders; Dumont Police Cadets – 1960 – 1963 (where he marched with his wife, Patsy as Drum Major); Sunrisers – 1970’s – Soprano Player; Bushwhackers – Contra Player; and he was Director of Sundowners Drum & Bugle Corps. In addition to a great personality, smile and sense of humor, Ray was simply one of the nicest and most dedicated people that you could be honored to know. He had friends in many corps and was a stranger to no one in our tight drum corps circle. May all Skyliners join hands to make our circle complete, so the circle becomes stronger. The Skyliners send our sincerest sympathies to Ray Peters’ family and friends. Posted by News Editor on Tuesday, January 30th, 2018. Filed under Current News, DCA News, FrontPage Feature.